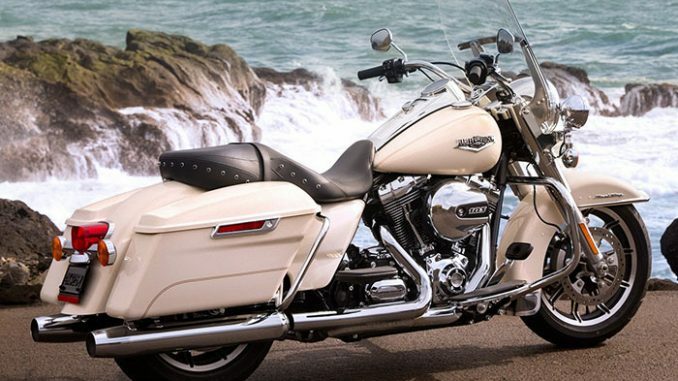 The 2015 Harley-Davidson Road King® is a touring motorcycle for the rider who prefers the look of a classic windshield to that of a fairing. Features include the powerful High Output Twin Cam 103™, bright Dual Halogen headlamp and halogen fog lamps, Impeller wheels, hard saddlebags and a easy-to-read speedometer. Reflex™ Linked Brakes with ABS are optional. Its air-adjustable touring rear suspension and a comfortable seating position are just what rider and passenger demand for long- distance comfort. Live your ride to the power of Twin Cam 103™. The air cooled Twin Cam 103™ Harley Davidson® engine delivers more stump-pulling torque, while its Electronic Sequential Port Fuel Injection jetting gives crisp, lively throttle reaction. It’s a performance punch that you’ll appreciate when passing, climbing hills, or rolling with luggage packed or a passenger in back—all under that signature Motor Company rumble. And it comes at lower cruising rpm, so you ride more smoothly, with less engine vibration and better highway fuel economy. Asking riders if they’d like more passing power is like asking them “Would you like more beer in the pitcher?” when they’ve reached their final destination at the end of a long, dusty ride. Everybody wants it, and the High Output Twin Cam 103™ engine is 103 cubic inches of Harley-Davidson V-Twin you can rely on to deliver it. The airbox delivers increased intake airflow and the cam optimizes phase and duration. The result: better low-end torque and faster 60 to 80 mph 5th gear roll-on to get you around that 18-wheeler. In the tradition of the Flathead, Knucklehead, Panhead, Shovelhead, Evolution® Twin Cam 88® and Twin Cam 96™ engines that came before it, the High Output Twin Cam 103™ engine is raising the bar for the feeling an engine delivers to the rider. There’s a reason we’re called the Harley-Davidson Motor Company. Once you send some fuel to this engine, you’ll have no doubt whose it is. The comfort of our machines has been dialed in the hard way: Over 110 years and thousands of miles in all kinds of conditions on every kind of street, road and highway ever laid down in pavement. Long hours in the saddle are the only way there is to learn what you need to know about things like airflow, heat management, seat materials and textures and the amount of effort it takes to pull a clutch lever. We don’t stop until we build the most comfortable machines you can throw a leg over. We all want to go farther, and when you and your rider are more comfortable in the saddle, you can. style and maximum comfort. 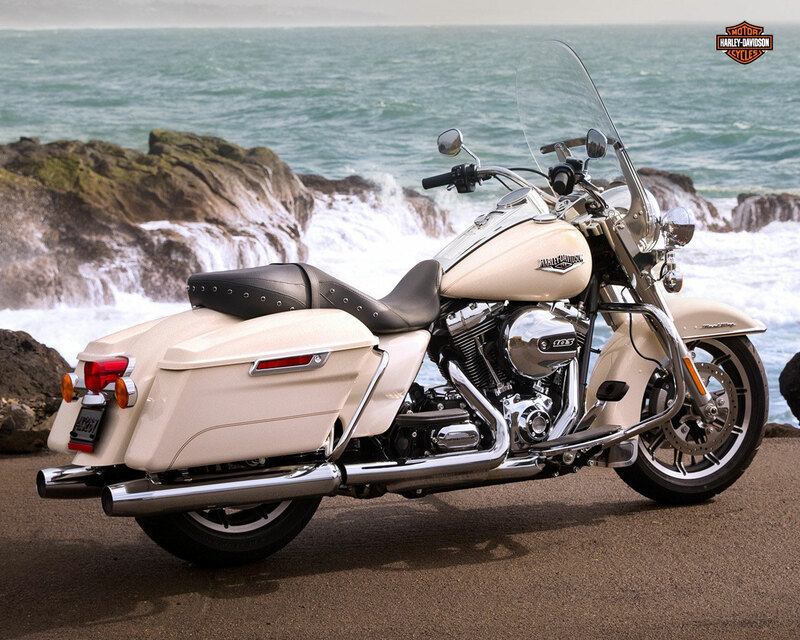 That’s the perfect balance of the wide set handlebars that come standard on the Road King® model. They’re designed to keep you comfortably propped in a commanding position while making sure your neck muscles stay calm and relaxed mile after mile, state after state. 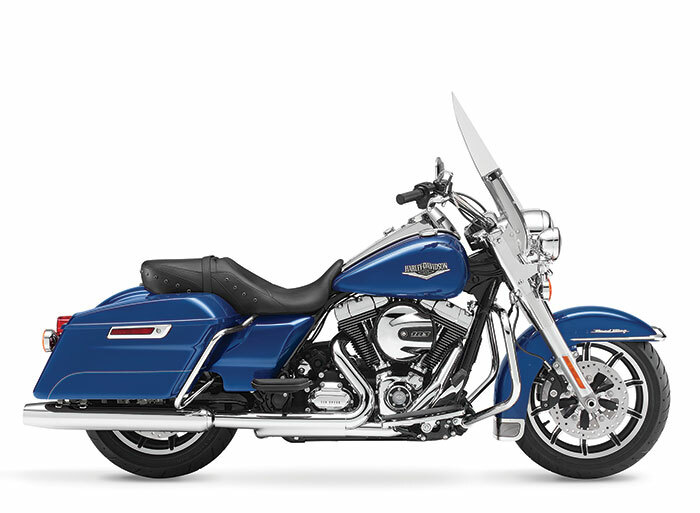 Durable stainless steel ensures the structural rigidity you expect from a Harley-Davidson® motorcycle with the deep, lustrous finish you desire. Go from touring to cruising in a heartbeat. Detach the screen for a clean, cool cruising style, or re-attach it in seconds for a clean envelope of air over the long haul. The windshield is as tough as they come—durable, scratch resistant, low maintenance. And whether you choose to have it on off, your Road King® motorcycle rules with a nostalgic style and versatility you can make your own. Don’t let the sleek look of these saddlebags deceive you. The look is tight on the outside, but things are roomy on the inside. You want stuffability and these deliver bigger than ever. The hinges are simple and clean and the lids open with one touch of one hand. The lock is tight and integrated into the latch where you can put the key in without the danger of scratching your premium paint. Welcome to the next level of the bagger. 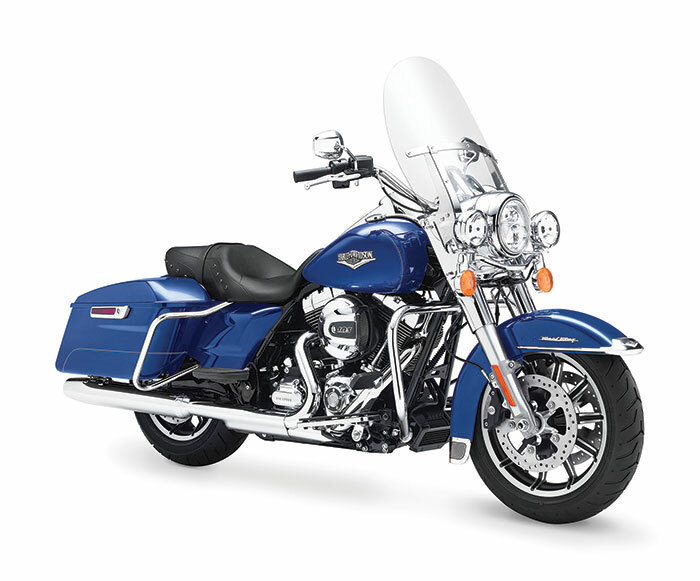 Sitting out front on the Road King model, you’ll notice a 17-inch cast aluminum, 10-spoke Impeller wheel. In the back you’ve got a 16-inch Impeller to match. The brake rotors are designed to show off more of the premium custom look of the wheels. Because if you’re going to go this far, you might as well take it all the way. Modern graphics and wider numbers give the Road King® motorcycle’s gauges an easy-reading modern look. There’s also an RPM read out and a gear indicator in the odometer display area. One quick glance tells you everything you need to know. Seat Height, Laden 7 26.7 in. Seat Height, Unladen 7 28.2 in. Weight, As Shipped 779 lb. Weight, In Running Order 814 lb.